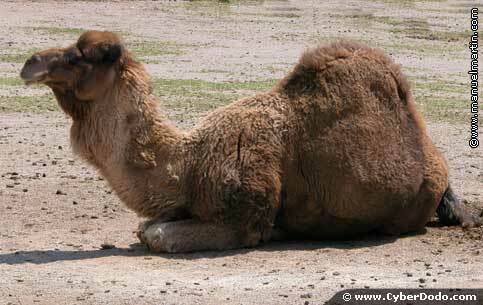 In the camelidae family, there is a camel with the scientific name of camelus bractianus which lives mainly in Asia and has two humps, and a dromedary called camelus dromaderus which lives mainly in Africa and has a single hump. Before our time, between the 3rd and 4th millennia, man began to domesticate this species for its meat, as well as its capacity to work and transport people in arid regions. Despite its not very common appearance, it's an extremely durable species which can tirelessly travel through steppes and deserts. The animal weighs about 700 kgs, is about 2 metres tall, has long legs to keep it away from the heat of the sun and large feet, with 2 toes, to stop it from getting stuck in the sand. Its buccal cavity is very strong and not very sensitive, which helps it eat prickly plants without getting hurt. It can also close its nostrils to protect itself from the sand. It walks in a very original manner, because it alternatively walks with both feet on one side of its body, then both feet on the other! This is called a "rotary walk". Its diet consists mainly of leaves - it can reach even up to 3 metres to get at them - as well as grass and grains. It takes about 8 hours every day to feed and can stock surpluses in its hump in the form of fat. CyberDodo and the Otter (1-52). The otter is a charming mammal which has very often paid with its life because of its beautiful coat of fur. Here is a case file to help you understand them better, since it is unfortunately becoming more and more difficult to find them in their natural habitat because it is being destroyed by man. They are the largest living creatures on our planet and yet their size has been unable to protect some of them from the grave threat of extinction. 3 minutes to discover CyberDodo!